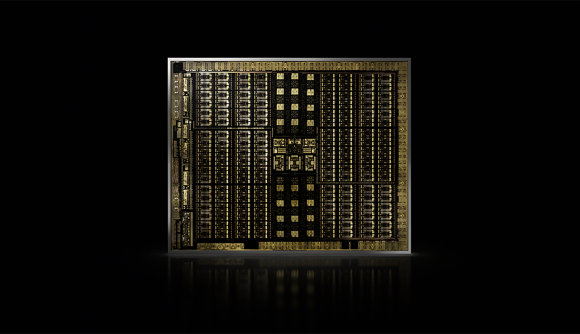 Nvidia has announced its next generation Turing GPU architecture at SIGGRAPH 2018. Nvidia is describing the step up to Turing as “the greatest leap since the invention of the CUDA GPU”, and that’s all thanks to a combination of Tensor Cores and RT Cores – dedicated computational silicon specifically designed to make real-time ray tracing possible. The first Nvidia Turing graphics cards will be the Nvidia Quadro RTX 8000, Quadro RTX 6000, and Quadro RTX 5000 – available in Q4 2018. The RTX is in reference to Nvidia’s ray tracing platform, RTX, which provides specific ray tracing APIs and SDKs for devs and designers to make the most of Nvidia’s GPUs in these high-stress tasks. After today’s announcement, the platform is more important than ever. Ray tracing has been held as the “holy grail” of rendering for years, although has been long out of the grasp of contemporary GPU technology. It works by tracing the path of light and how it interacts with virtual objects, which, in turn, allows for a much higher degree of realism than current rendering techniques and workarounds. This includes accurate shadowing, reflections, refractions, and illumination. 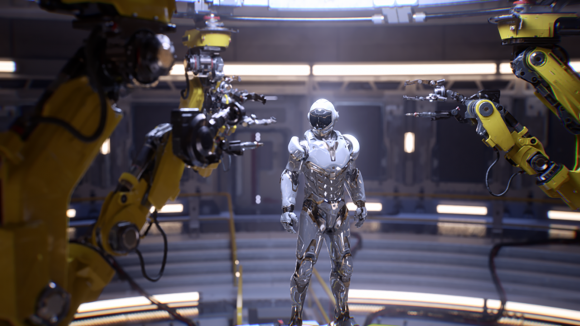 But Nvidia believes it has nailed ray tracing with the Nvidia Turing architecture. Its dedicated RT Cores speed up ray tracing computation by 25x over the current Pascal generation, and along with AI denoising Tensor Cores, Nvidia’s Turing Quadro RTX 8000 was perfectly capable of running the entirety of Epic’s Star Wars ray tracing demo alone. That’s no small feat. When we first saw this stunning demo it was running on a DGX station worth $70,000. Only months later, it runs on a single card – albeit a $10,000 one. The Turing GPU, named after British mathematician and computer scientist Alan Turing, features a whole new streaming multiprocessor (SM), too. These new core clusters add dedicated integer cores and a unified cache architecture. The top Turing GPU will feature 4,608 CUDA cores, 576 Tensor Cores, and take up 754mm2 on the card – a considerably larger footprint than Pascal at 471mm2. Turing will also be fed data by speedy GDDR6 memory – Samsung’s 16Gb GDDR6 chips to be precise. The top Quadro RTX 8000 card comes with 48GB of GDDR6, the Quadro RTX 6000 24GB, and the Quadro RTX 5000 16GB. These Quadro cards also confirm Nvidia’s commitment to the VirtualLink standard. Confirmed last month, VirtualLink is a USB Type-C port designed to deliver all the power and data required for a VR experience, and Nvidia has been working alongside Valve, Oculus, AMD, and Microsoft to implement the new standard across various hardware to create an industry standard. But this isn’t confirmation of the Nvidia GTX 1180 / 2080 just yet. The Quadro cards, for all their technical advancements, also come with a huge price premium: $10,000 for the RTX 8000, $6,300 for the RTX 6000, and $2,300 for the RTX 5000. The considerably cheaper GeForce cards won’t be quite as kitted out. But, at least we have some idea of what to expect on August 20, 2018. That’s the day Nvidia will be holding its GeForce Gaming Celebration in Cologne, only moments before Gamescom kicks off. Nvidia is promising “spectacular surprises” at the event, which is almost certainly next-gen GeForce graphics cards. If it’s just another Nvidia PC monitor after all this, I’ll start flipping tables.